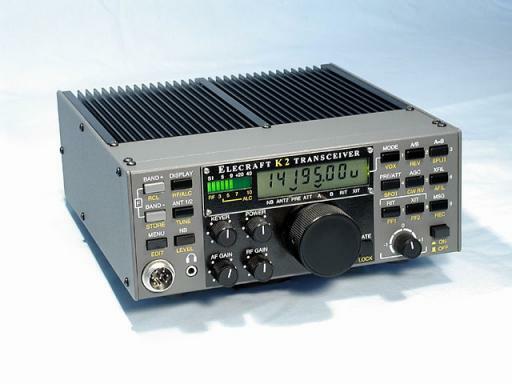 Purchase, build and install the Elecraft XV50 six meter transverter. I have also built an N0SS wideband HF noise generator into an Altoids tin. The noise generator creates a broadband noise that can be used with PC soundcard-based spectrum analysis software such as Spectrogram as a tool to aid the alignment of the K2/100's crystal filters for best reception. It is a way cool little toy. I ordered a partial kit from Don Brown KD5NDB for $15 that included the circuit board and parts. I provided a small switch, the Altoids tin, and a BNC connector. The KPA100 module begins to reduce output power at a 2:1 SWR level, and the higher the SWR gets, the less power the rig will put out. All 100W solid-state rigs behave in much the same way, but the 2:1 threshold is lower than on many other rigs, making the Elecraft K2/100 more sensitive to input SWR than most HF contest rigs. Solution: Use the Elecraft KAT100 autotuner if your antennas are likely to exhibit a SWR greater than 2:1. There is no audio monitor available on SSB. Many phone contesters rely upon the audio monitor to check for RF getting into the audio lines during the course of a contest, a condition which can change from hour to hour as the contester moves to different antennas, points them in different directions, moves to different bands, and sometimes finds a combination of circumstances that a pre-contest check for RFI would never find. Monitor audio is also extremely useful when using a DVK, as a means to verify that the recorded message sounds good. Most serious phone contesters refresh their DVK recordings several times in a contest weekend. Solution: I don't know of a good one. The stock optical encoder for the Elecraft K2/100 is 25 counts/revolution, which gets quadrupled to 100 tuning steps per revolution, which at the 10 Hz tuning step size yields a tuning rate of 1 kHz per knob revolution. This is probably too slow for most contesters, and especially phone contesters, who would have to tune more than a full knob revolution just to get to the next signal on a crowded band! The obvious solution is to use an optical encoder with more counts/revolution. The highest resolution direct replacement for the Elecraft K2/100 yields 200 counts/revolution, or 8x the stock encoder. Unfortunately, the Elecraft K2/100 firmware cannot keep up with a fast-turning 8x encoder, and even a slow-turning 8x encoder feels too sensitive at the 10 Hz frequency step size, because the knob has such a small circumference. Solution: So far, I am pretty happy with a 4X encoder. If I try very hard, I can spin the knob too fast, but it takes an unnatural effort. The Elecraft K2/100 does not have a transmit button on the front of the radio. To key the radio in SSB, you must either use VOX or you must use a footswitch attached to the PTT line of the microphone input or the CW key jack. If you want to leave the radio connected for CW contests, or you are working a mixed-mode contest, this leaves VOX or a footswitch attached to the microphone jack. If your footswitch breaks during the contest, you may be stuck trying to cope with VOX. (At some point, it would be cool if the firmware could make PF1 or PF2 a T/R switch.) Solution: use a footswitch and own a backup footswitch. "The RANT instruction is too clumsy for contest operation. Although we set up Fast Play to jump directly to the menu RANT ON/OFF it requires three key presses to change RANT and another three to get back to where you started from. Ideally, it should be possible to set the K2 so that one key press toggled RANT on and off. This would be a useful firmware enhancement," reports G3PJT who operated CQWW CW 2002 from XT2DX. Supposedly, this is a firmware enhancement in the works, according to Wayne WA6HHQ. Solution: The Elecraft KRC2 can (I think) have one of its buttons programmed as a RANT on/off switch. Make the Keyer knob act as either a Mic Gain or Mic Compression control when the rig is in USB or LSB mode. This could be deemed important in multi-op environments where different operators, with different voice volumes are using the radio. Going into menus to switch mic gain can be cumbersome.